Sweet Noodle Kugel is a traditional Jewish dish, often served during Hanukkah, and now can be enjoyed by almost everyone with this gluten free, dairy free, vegan and refined sugar free version! With a creamy cinnamon cashew cream cheese sauce, apples, raisins, pecans and perfectly soft yet chewy noodles, you’re going to love this unique and festive treat! Happy first day of Hanukkah! ? 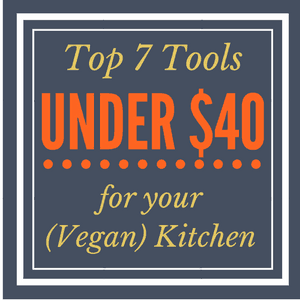 We’re celebrating here on Vegan Chickpea with one of my favorite Jewish dishes – KUGEL! If you’re not familiar with kugel, it’s a casserole often made with egg noodles and it can be sweet or savory, eaten hot or cold. Essentially it’s egg noodles (or sometimes potatoes), some combo of cheese/cream cheese/sour cream, eggs, sugar, cinnamon, raisins and apples. 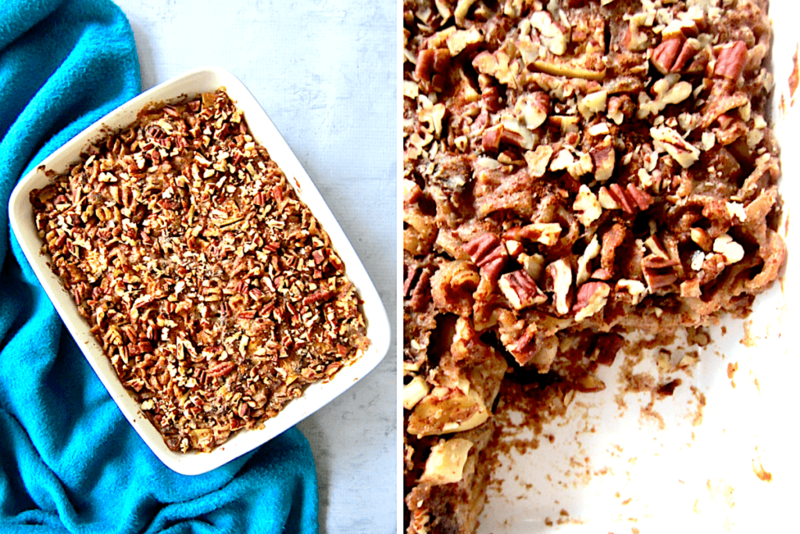 Growing up, we always ate my Granny’s sweet noodle kugel for dessert during Hanukkah. My dad is Jewish and my mom is Catholic, so we were raised celebrating BOTH Hanukkah and Christmas! I always felt really lucky and special as a kid getting to celebrate both, and now as an adult I’m super grateful for the exposure to different religions and growing up in a house where it was natural to embrace different religions versus fight about it… such contrast to the world at large! Now… I know what you may be thinking. At first, pasta for dessert may seem a little strange. In fact, I’m pretty sure I’ve never, ever had pasta for dessert OTHER than kugel. Can you think of any others? Even weirder may be to have COLD pasta for dessert (or in my case, breakfast, which is when I was eating these leftovers). But somehow, it just magically works! Now that I’m vegan and gluten free, I wanted to reinvent the wheel here and come up with a sweet noodle kugel that would still make any Jewish grandmother proud. While this ain’t your babushka’s typical recipe, I was actually completely surprised at JUST.HOW.DELICIOUS. this turned out! I’ll admit I was a little skeptical if I could pull this one off… but with the creamy cashew cheese sauce sweetened with maple syrup, lots of cinnamon and Tresomega Nutrition’s Fussili Noodles that cook to a perfect al dente texture, the flavors and textures were spot on. 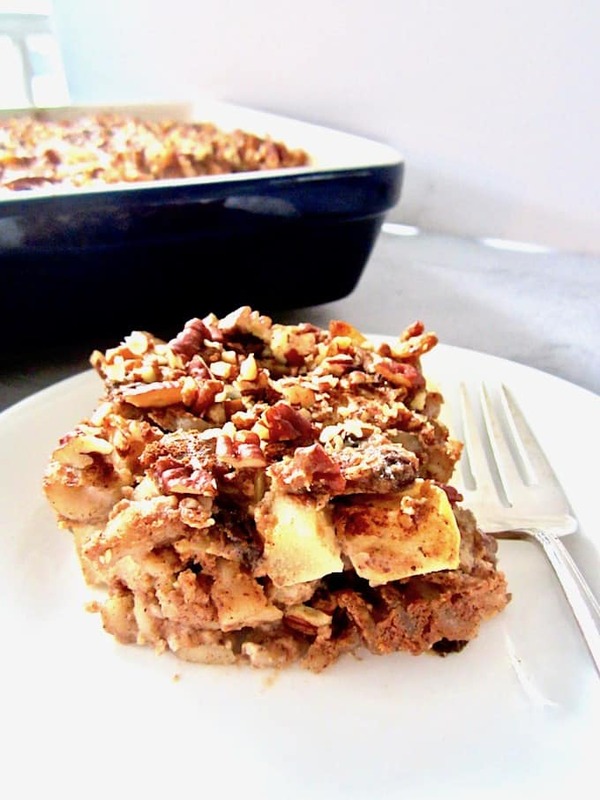 I added some pecans on top for extra sweetness and crunch to compliment the top layer of chewy baked noodles that get a little browned from the oven. I couldn’t be happier with this recipe! I created this recipe for Tresomega Nutrition’s “Organics For Life” Blogger Recipe Challenge. You may have seen my first entry with this Easy Garlic + Balsamic Roasted Veggie Pasta. The contest has 3 categories: Baking, Entrée and Appetizer with a $500 prize awarded to the winner of each category! Wish me luck. ? 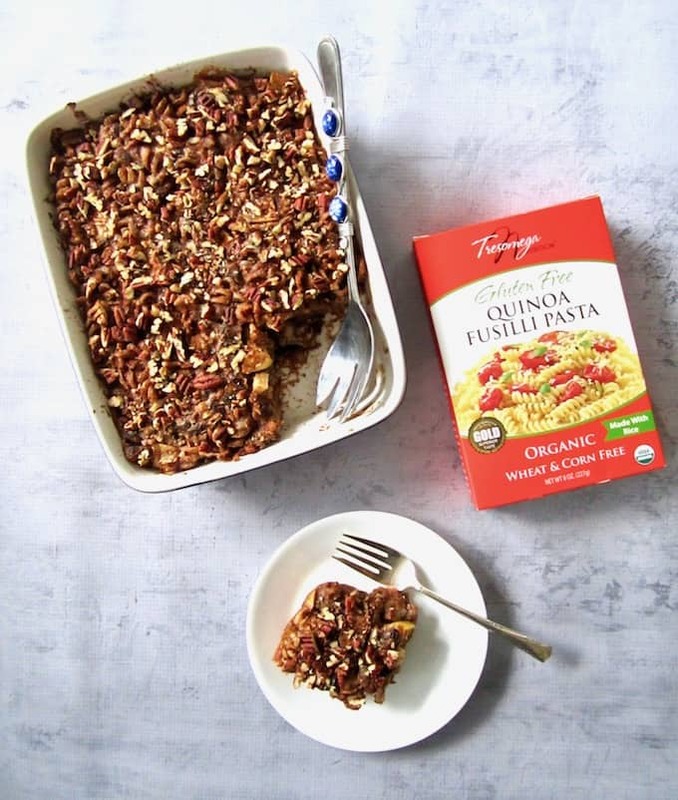 Tresomega Nutrition’s organic pastas are gluten free, made with a blend of ancient grains like quinoa, amaranth and rice. It’s a good source of protein that cooks to an al dente texture – no mushy pasta here! 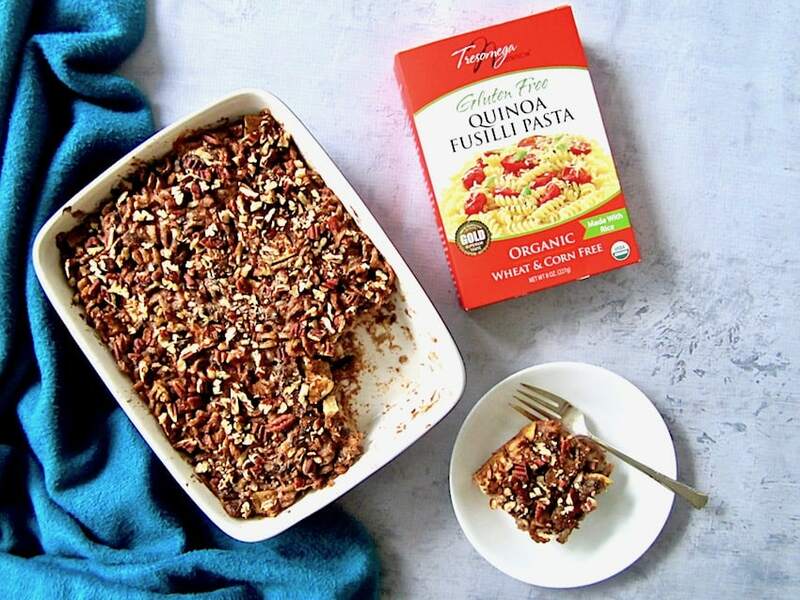 This means that the whole family can enjoy this healthier pasta and no one will know it’s gluten free, plus the fusilli spirals really make for a beautiful substitution for the traditional egg noodles in this vegan sweet noodle kugel! (Say THAT 5 times fast!) ? So go ahead – whether or not you’re Jewish or celebrate these ‘8 Craaaazy Nights’ (Adam Sandler anyone?! 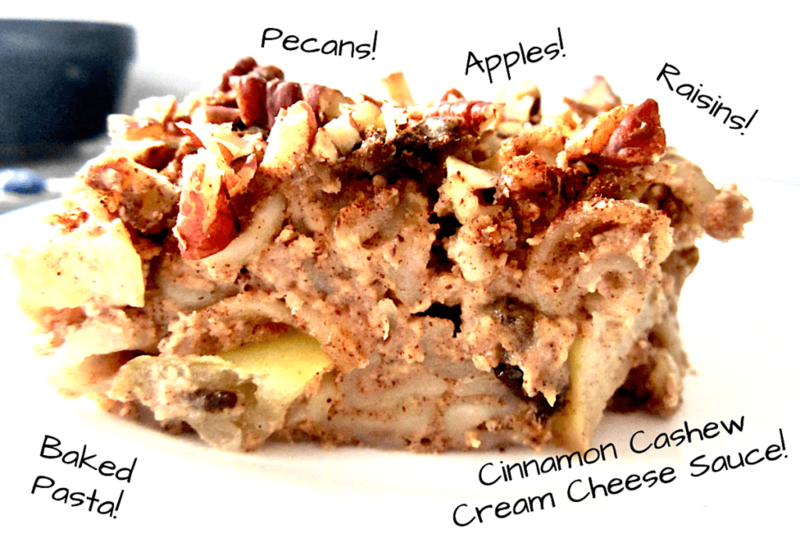 ), you should branch out, try out something new and make this sweet noodle kugel. I know you’re going to love it! Sweet Noodle Kugel is a traditional Jewish dish, often served during Hanukkah, and now can be enjoyed by almost everyone with this gluten free, dairy free, vegan and refined sugar free version! With a creamy cinnamon cashew cream cheese sauce, apples, raisins, pecans and perfectly soft yet chewy noodles, you're going to love this unique and festive treat! Make the cashew cream cheese sauce: combine all ingredients in a high speed blender and blend until creamy. Cook the pasta to al dente. Drain and rinse the pasta under cold water. Return to the pot with the vegan butter and 2 Tbsp cinnamon. Stir to combine. Add the cashew sauce, applesauce, apples and raisins to the pot, and stir to evenly combine. Pour the mixture Into a greased 10x8 baking dish. Evenly distribute and gently press into pan. Sprinkle the top with extra cinnamon and the pecans. Bake for 40 minutes. Let sit a few minutes before serving. Can be enjoyed hot or cold! This looks and sounds pretty AWESOME! Can I freeze this if I make it ahead of time?